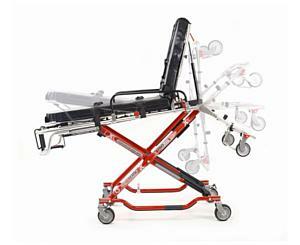 Ferno's PROFlexX cot provides the superior stability and safety you need when transferring and transporting patients. A longer fixed front leg in the X-Frame provides minimal flex and a low center of gravity at all heights. This means you may be less likely to flip or tip a cot during transfers and transport, reducing situations that may cause injury to you or your patient. 5 position load frame provides superior maneuverability and multiple lift positions for different size operators. Wider bed surface for comfort and support of any size patient.